NOTORIOUS Papua New Guinea bank robber William Kapris has been killed in a shoot-out with police, ending a nearly three-month man-hunt. Kapris and his accomplice Raphael Walimini were shot and killed on Monday evening near Bereina government station, about 45km outside of Port Moresby. "After three months of operations ... today we caught up with him following a tip off from the public," Police Commander Jim Andrews told reporters. "As we were moving in to apprehend them there was an exchange of fire." Police had offered a $A100,000 reward for the pair. No police officers were injured in the shoot-out. The grounds of Port Moresby General Hospital was teeming with armed police on Monday night. More than 30 were used in the operation to recapture Kapris, who was known in PNG for a series of robberies at Bank of the South Pacific branches. 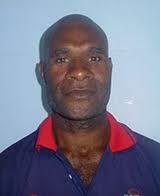 Kapris and Walimini escaped PNG's Bomana prison on May 14 after walking out the front gate. In 2010, the country's most wanted serial bank robber escaped from custody in a Toyota truck after taking a warder hostage. He was aided that time by a woman who, posing as a lawyer, pulled a gun on guards. He was rearrested a short time later, along with several jail staff who allegedly assisted his escape. It was not the first time Kapris had escaped PNG's justice system. Before being captured in 2008, he had been on the run for eight years after escaping police detention while convalescing at Port Moresby General Hospital. "It cost the government huge sums of money because of his continuous escapes from jail," Commander Andrews said. "This is the end of the operations to capture him."